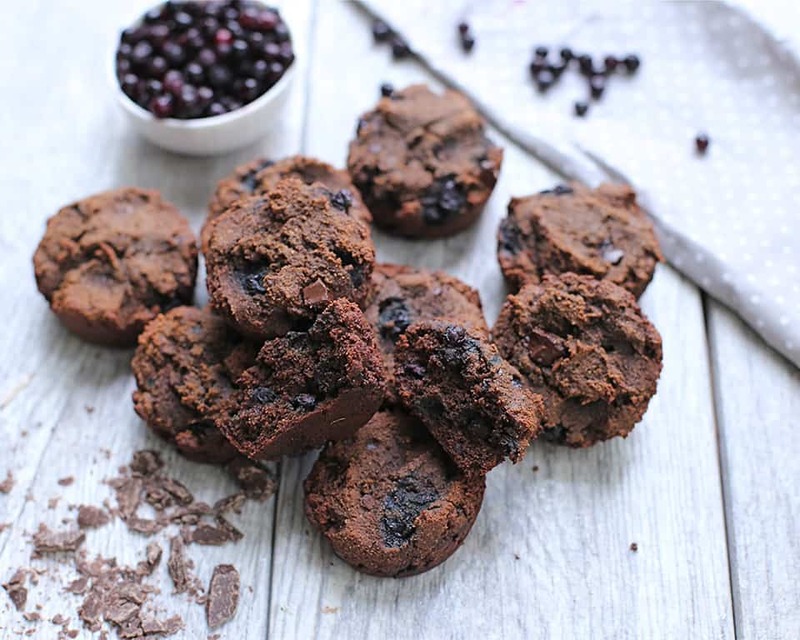 These Chocolate Blueberry Muffins are deliciously moist and fudge-y! 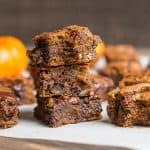 They make a perfect breakfast or snack and are so easy to make. Packed with protein, flavor, and antioxidants! I’m all about the chocolate you guys. I heard somewhere that February is National Chocolate Month, and I’m not quite sure if that’s legit or not, but I’m going with it! After a month of Whole30, I could not wait to get back into the kitchen baking, and especially couldn’t wait for some chocolate. I have never gone 30 days in my life without chocolate! Haha! We eat mostly grain-free and gluten-free, and now after a month of Whole30 followed by a week of vacation, my husband and I realize just how much better we are without any of the junk in our diet. But, that doesn’t mean I have to eliminate chocolate or sweetened treats. No way. It just means we’re strict Paleo for 95% of the time. 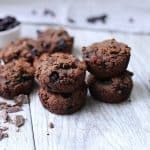 These little muffins pack in the dense chocolate flavor I love, and are sweetened just the right amount with honey. 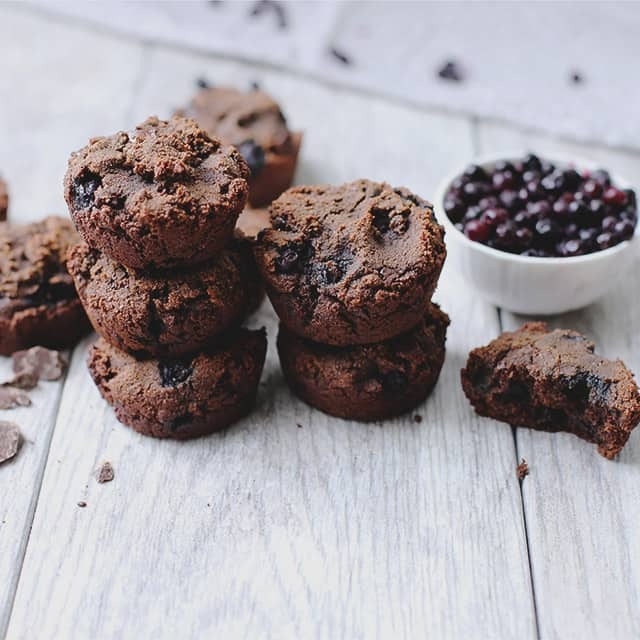 The inside of these muffins are packed with blueberries and some more chocolate. Surprisingly, muffins was one of the foods I missed the most on Whole30. 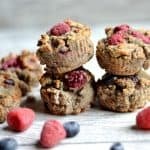 Kind of strange since I didn’t realize I liked them so much, but I kept eyeballing my Grain-Free Maple Pecan Banana Bread Muffins and wanting them in my belly!!! I knew I would be baking up a storm the first week in February. This is my third batch of muffins in a week! 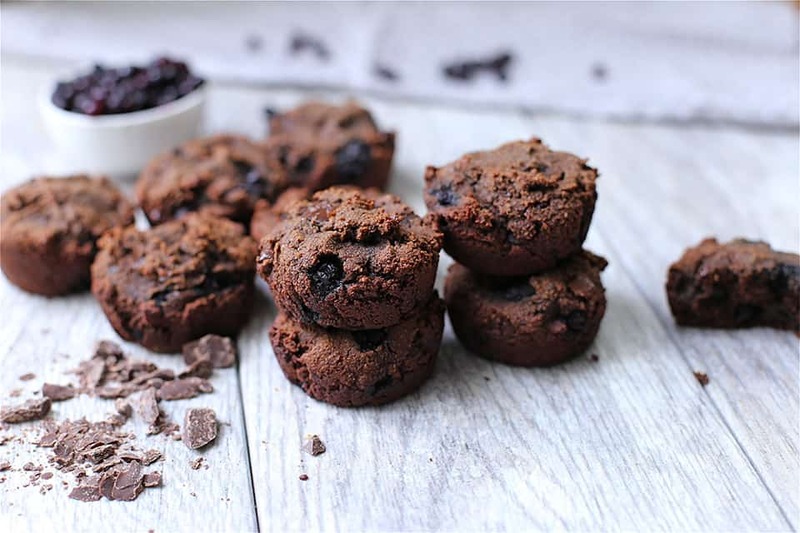 The best part is that these muffins can be easily frozen, and eaten on days where you have a busy weekday morning. 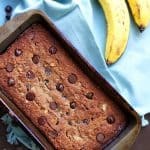 They make a perfect on the go snack or breakfast! A few other notes, I used a chopped up Paleo compliant chocolate bar. You can use regular mini chocolate chips, chocolate chips, chopped chocolate, or these dairy free chocolate chips. Preheat your oven to 350 degrees. Line a 12 cup muffin tin with cupcake liners and spray a non-stick spray to liners, or you can also just generously grease the pan. Set aside. In a large bowl, mix together your dry ingredients: flours, cacao powder, baking soda, and salt. In a smaller bowl, whisk together eggs, melted coconut oil, honey, and vanilla extract. Fold wet ingredients into dry. Continue to mix, batter will be very thick. Now fold in blueberries and chocolate and mix until well combined. Use a large ice cream scoop or spoon to pour batter into the ban. Fill approximately 2/3 way full. Bake for 17-19 minutes, or until an inserted toothpick comes out clean (don't confuse with melted chocolate). Let cool for at least 5 minutes before removing from the pan. Muffins can be stored in an air tight container in the freezer for several weeks. 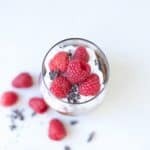 Made them today and they quick and easy to make, and delicious! Very moist and flavorful. I used 3/4 cup of blueberries and was glad I used that about! Thank you for your amazing recipes!! Do you have the nutrition facts on these?